Those who believe in the healing powers of natural ingredients would probably know about the health benefits of coconut. Indian homes have been using the goodness of coconut in various forms over generations. This is one fruit that can be used to take care of all your needs. Coconut is a fruit which belongs to the Cocos nucifera palm. This mature nut is one of the most used ingredients in the kitchens of India. Hundreds of coconut species are found all over India and its taste vary according to its soil alkalinity. Its outer part is of green in colour which turns brown as it matures. Underneath the hard shell is the white edible meat. Coconut is also known as ‘Nariyal’ in Hindi, ‘Kobbari Bondam’ in Telugu, ‘Tenkay’ in Tamil, ‘Karikkin’ in Malayalam, ‘Thengina Kai’ in Kannada, and ‘Narikelera’ in Bengali. The freshly harvested coconut contains sweet water which is extremely beneficial for health. Coconut is a healthy nut that can be used safely as a food. It is mainly reaction free. The kernel is not only healthy but is also safe to be eaten during pregnancy. 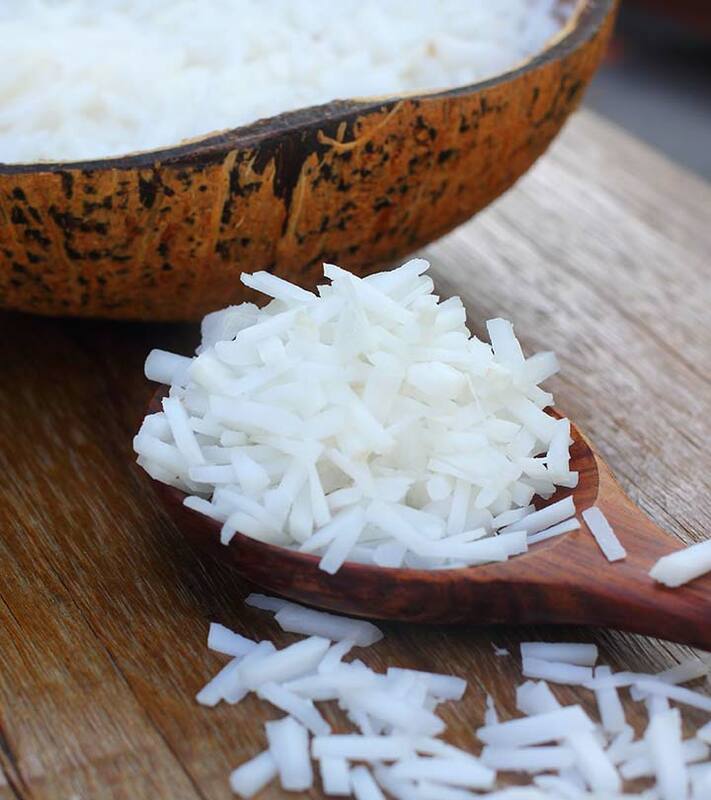 Coconut is high in dietary fibre and provides a whopping 61% of fibre. Coconut fibre slows down the release of glucose and transports it to the cell were it is converted into energy. It assists in relieving stress on the pancreas and enzyme systems which reduces the risk of developing diabetes. Coconut improves the insulin secretion and utilization of blood glucose. It controls diabetes by positively affecting the hormones for blood sugar control. This slows down the rise in blood sugar level and helps to reduce glycemic cravings. Coconut benefits quick digestion and other symptoms associated with digestive and bowel disorders. It supports absorption of nutrients and minerals while providing dietary fibre. It also reduces vomiting and nausea. Coconut nutrition is excellent for the immunity system. It is antiviral, antifungal, anti-bacterial, and anti-parasitic. Intake of coconut oil can help the body to mount resistance to both viruses and bacteria that cause illness.Consuming coconut in its raw form can help to treat some of the worst and most resilient illness like throat infections, bronchitis, urinary tract infection, tapeworms and other ailments caused by microbes. Coconut is also beneficial in treating dangerous fats in the abdominal cavity. 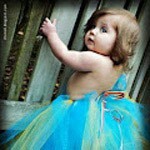 Abdominal fats are the most dangerous of all the fats and are associated with various diseases. A 200 grams of coconut serving daily can lead to significant reduction in both BMI and waist circumference in just 12 weeks. Research has proven that people who consume coconut daily are healthier when compared to those who don’t. In some countries it is a dietary fibre that people have thrived on for many generations. Coconut helps to increase energy by burning fat. The triglycerides found in coconut oil increase 24 hours of energy expenditure by 5% leading to weight loss in the long run. It is also known to reduce hunger pangs. This is directly related to the way fatty acids in the body are metabolized as ketone as appetite reducing effect. People who consistently use coconut products have a stronger ability to go without eating for several hours with no effects of hypoglycaemia. It also promotes healthy thyroid function and helps to relieve the symptom of chronic fatigue. A ketogenic diet is a low carb diet which is used to treat various disorders. Its best known application is treating epilepsy in children. The diet involves eating little carbs and large amounts of fat which can lead to increased concentrations of ketone bodies in the blood. This diet can dramatically reduce the rate of seizures in epileptic children. Coconut nutrition has also proven to have anti-cancer properties. It is especially beneficial to treat colon and breast cancer. Coconut water contains crucial electrolytes that help in maintaining hydration. People involved in easy workouts and other strenuous activities should include as much coconut water as they can in their diet. Coconut water replaces the lost electrolytes, provides hydration and increases immune response. It is a better alternative to water as it is tastier than plain water and is loaded with nutrition. Coconut water is considered to be more nutritious and healthier than whole milk. It contains lauric acid which is considered equivalent to mother’s milk. It is naturally sterile as it permeates through the filtering husk. It also cures hangover. Coconut water has a natural isotonic beverage in the same level as that in the blood. The natural diuretic property of coconut treats urinary tract infections. It improves the flow of urine to get rid of the infection naturally. Coconut helps to improve blood cholesterol levels in the body and lowers the risk of heart diseases. 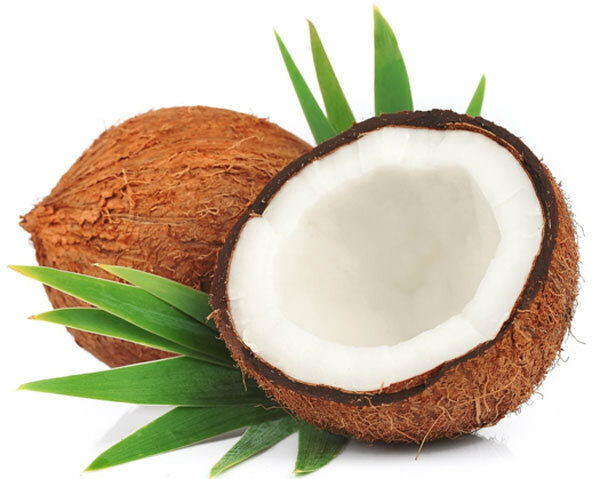 The saturated fats in coconut raise the good cholesterol in the body and control the LDL to a benign subtype. This improvement in cardiovascular risk factors theoretically leads to reducing risk of developing heart diseases. Coconut water is sterile and is very good for pregnant ladies. It improves the immunity and health of the mother and baby and prevents infection and other diseases. It also boosts the levels of amniotic fluid to improve the overall health of the fetus. Coconut contains high content of monolaurin and lauric acid which helps to kill bacteria, viruses and fungi and keeps infections at bay. Coconut water can also be used as an out rinse to kill mouth bacteria, reduce bad breath and improve the overall dental health. Eating coconuts regularly supports the development of healthy bones and teeth. It improves the body’s ability to absorb calcium and manganese which aid bone development. It also prevents osteoporosis, a condition which makes the bones thin and fragile and loses its density. Thus it is a healthy alternative for those who are lactose intolerant. Coconut is often used in the form of oil in the cosmetic industry to improve the health and appearance of the skin and hair. Coconut oil, if used on skin prevents dryness and flakiness and keeps it moisturised and supple. It also supports the skin and works to repair the damage it has acquired over time. It eases a common skin condition called neurosis, which is characterized by dry, rough and flaky skin. It also reduces the severity of atopic dermatitis which is prone to infections like Staphylococcus aurous. Use of coconut cleanses and neutralizes the toxins, fungi and bacteria on the outer layers of the skin which not only detoxifies but also builds the skin’s natural immune system and protection. Extra virgin coconut oil can also be used to treat dry and parched hands. Regular dish washing often dries out the skin and makes them unsightly. Instead of using expensive chemical laden cosmetics, apply virgin coconut oil on the hands to get beautiful and smooth hands. It improves the moisture and lipid content in the skin and prevents skin cancer by blocking 20% of harsh Ultra Violet rays. It can be used as a body and skin moisturiser as it hydrates the skin by replenishing the natural oils. Coconut oil can also be used to clean the face by rubbing it in circular motions. Coconut oil is excellent for keeping the skin young and beautiful. Its antioxidant property slows down the ageing process by protecting the body from harmful free radicals. Massaging a few drops of coconut oil daily will keep it healthy and smooth. Apply it onto the skin before showering. This will open the pores while showering and will allow the oil to absorb through the skin more efficiently. Eating coconut hydrates the skin and makes it youthful and supple. Take a teaspoon of raw, uncooked coconut oil and massage the skin with it. This will minimise the outbreaks of skin, rashes and irritations and will beautify the skin from inside when taken internally. Eating coconut regularly boosts oxygen in the skin and promotes blood circulation. Our cells need adequate amount of oxygen which can only be made possible by proper circulation in the body that carries oxygen. This allows proper breathing of the skin and promotes healthy and flawless complexion. Coconut water can also help to reverse tanning. Mix fullers earth with coconut water and apply it all over the skin. Leave it for 20 minutes and then wash it off with cold water. Apply this face pack twice weekly to get a tan free skin. Coconut water can also be used to treat oily skin. It washes away excess oil from the skin and keeps the skin tone more even. Coconut water is also very effective on acne, black spots and blemishes. Make a face pack by mixing half a teaspoon of turmeric, 1 teaspoon of sandalwood powder and coconut water. Apply it on the face thrice weekly to get clear and glowing skin. Coconut oil can also be used to remove eye makeup. Put a few drops of coconut oil on a cotton ball and wipe your eyes with it. It effectively removes the tough eye makeup by breaking down the ingredients in the eye makeup. It keeps the skin hydrated too. Coconut can also be used as a body scrub. Mix some coconut oil and a cup of brown sugar and stir well. Finally scrape some coconut shell, add a few drops of essential oil and mix it. Your scrub is ready to use. You can also mix 1 tablespoon of coconut water and lentils to make a paste. Rub it gently on the face for 2 minutes and then wash off. Coconut for hair helps to treat hair loss problems. Both coconut water and coconut oil can help to treat hair fall. Massage your hair with coconut water or coconut oil prior to bathing to manage unruly hair and prevent hair breakage. This will also make the hair soft, smooth and manageable. The antibacterial and antifungal properties of coconut protect the scalp from dandruff, lice and itchy scalp which often slows down the hair growth. Coconut is rich in calories, vitamins and plenty of minerals. An average 400 grams of coconut flesh provides almost all the vitamins and minerals required by the body for a day. 100 grams of coconut kernels contain around 350 calories. It contains high saturated acids like lauric acid and bioactive compounds that are essential for better health. The kernel is an excellent source of copper, calcium, manganese, magnesium and zinc. It is also a good source of folates, niacin, thiamine and pyridoxine. The fruit is also a good source of potassium. Coconut water is very refreshing and contains simple sugars, electrolytes, minerals, acid phosphatise, catalase, dehydrogenise, peroxidise and polymerases. Not just the water, its oil is also classified as a super food. Its unique combination of fatty acids can have profound effects on your health. 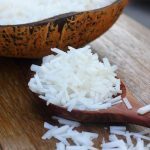 Hope you liked this article highlighting the various coconut nutritional benefits. Do share your valuable feedback in the comments section below.